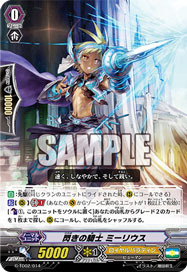 [A] [(R)]: [Soulblast: (1)] When this Boosts a Vanguard, yoiu may pay cost. If so, draw a card, and discard a card from your hand. [C] [(R)]: During your turn, if you have a Rearguard with "Namazuo Toushirou" in name, this gains +2000 Power.